When AC1 Orchard was posted to No.12 (Bomber) Squadron on 28th September 1936, the squadron had just returned from Aden. The invasion of Abyssinia by Italy in 1935, had brought Britain close to the brink of war, and several squadrons had been sent to the Near and Middle East to strengthen the RAF. Among them were Nos. 12 and 41 Squadrons, who were posted to Aden. Both squadrons returned to England in less than a year, and No.12's Operation Records show that it left Aden on 11th August aboard HMT 'Somersetshire', arriving in Southampton on the 29th, from where it proceeded to its home station at Andover. Also based at Andover at this time were two other bomber squadrons, Nos.103 and 107, as well as a Staff College and a Station Flight. On October 6th 1936, control of the Station was transferred from No.3 to No.2 Bomber Group. For some years No.12 Squadron had been the only one in the RAF equipped with Fairey 'Fox' aircraft, a type issued in 1925. 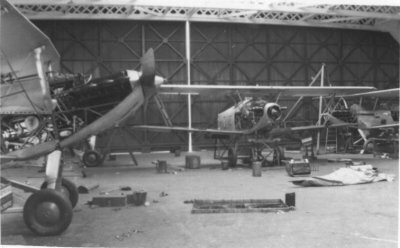 In 1930 the machines had been fitted with an improved engine, but by the time they were posted to Aden the Squadron had been re-equipped with Hawker 'Harts', a light bomber which, in one variant or another, equipped several squadrons during the 1930's, some still being in service with Auxiliary Air Units as late as 1940. Shortly after Harold joined them, the squadron's Harts were replaced with a day-bomber version known as the 'Hind', and Harold was assigned to the care and maintenance of aircraft number K5550, in which he had a great deal of pride. The Hind was not a particularly large aircraft. It was, of course, a biplane, and had an upper wing span of 37ft 3in and a length of 29ft 7ins. It is interesting to compare this with the Spitfire's wing span of 36ft 10in and length of 29ft 11ins. The Hind carried a bomb load of some 500lbs, and was armed with two machine guns, one Vickers and one Lewis. The aircraft was powered by a Rolls Royce Kestrel engine, giving it a maximum speed of around 180mph and an operating ceiling of just over 21,000ft providing the crew were equipped with oxygen. The Hind was the final biplane design to enter service with the RAF, and in 1937 was still its most advanced light bomber. During Harold's eight months with 12(B), much of his time would have involved the routine of aircraft maintenance, as well as continuing his training, as he attended classes two or three times a week. In addition to the routine, the Operations Records of both No.12 Squadron and Andover Station note several interesting events. On December 3rd 1936 No.142(B) Squadron returned from its overseas postings arising from the Abyssinian crisis. They had been stationed at Mersa Matruh, and later Ismailia. In February 1937, the majority of the personnel of 'B' Flight left 12(B) to form the nucleus of a new Squadron, No.63(B). Harold himself was to be involved in a similar exercise later that year. The formation of these new squadrons was part of the Government's continuing expansion of the RAF announced in 1936. The threat from Hitler's Germany was being taken seriously by now. 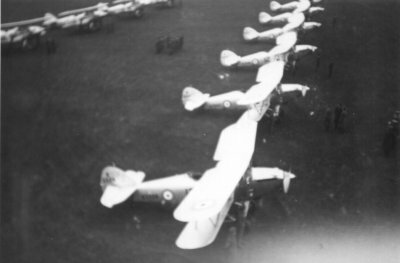 Later that month, No.107(B) Squadron moved to Old Sarum, and a few weeks later 36(B) moved to Upwood, 103(B) to Usworth, and 44(B) arrived at Andover from Wyton. On 13th April, 12(B) was on parade with the rest of the Station when Air Chief Marshal Sir John Steel presented the Squadron with its unit badge. The next event of note occurred on 12th May 1937, when the Operational Record notes that 'S/Ldr. C.E.N. Guest O.B.E. and 11 other ranks took part in lining the streets of London for the coronation of King George VI'. Harold was not one of the 11. A visit of great historical interest took place seven days later when the German General Field Marshal von Blomberg came to Andover, and inspected the aircraft and personnel of 12(B), 44(B) and 142(B) Squadrons. Afterwards he was treated to a 'fly past in various formations' by 10 aircraft, five from 12(B) and five from 44(B) Squadron, and also saw some of the RAF's new aircraft in the shape of Blenheims, Whitleys and Harrows. No doubt the German War Minister was pleased with what he saw. At this time the Luftwaffe was far in advance of the RAF in terms of equipment and experience, units of it being involved in the Spanish Civil War. This did not prevent von Blomberg from urging caution in the Nazi moves towards a European war, and he was dismissed by Hitler early in the following year, ostensibly because of an 'unsuitable marriage' with his secretary. A few days after that, on the 25th May, another demonstration was laid on, this time for the members of a Higher Commanders course. A target representing a bridge was laid out at Porton. Three patterns of bombs were dropped, two scoring direct hits. On the 29th May, Empire Air Day came round again. 12(B) is recorded as having provided four demonstrations for the visiting public. These consisted of a squadron formation of three flights of three aircraft and formation changing; a low flying attack on a motor convoy by three flights of three aircraft in line astern; dive bombing by a flight of three aircraft; and a high level bombing raid whilst under attack by fighter aircraft and anti-aircraft guns. In all, there were more than 3000 visitors to Andover, and £117 was raised for the RAF Memorial Fund. Yet another demonstration was provided by 12(B) on 2nd June, this time for members of the Imperial Defence College. The 'bridge' at Porton was again used, but this time poor weather meant that bombs had to be dropped from 250ft. Four patterns were dropped, scoring three direct hits. No doubt all these events kept the ground crews, including Harold, more than busy with maintenance and repairs. This was the last event witnessed by Harold whilst with 12(B) Squadron, although he would no doubt have seen the preparations for the squadron's contribution to the last RAF Display at Hendon, held on 23rd June, as his new squadron remained at Andover until early in July.